Some pool pumps can use as much energy as the rest of the electrical devices in a household combined. That can leave pool owners paying $1,000 or more annually just to power a pump, costs that add up year in and year out. Even with this significant downside noted, conventional pool pumps often conceal drawbacks of even more pointed sorts. Although such accidents are relatively rare, children and infirm people are drowned every year by pool pumps whose suction entraps them underwater. Standing at the high end of the market, the Pentair 011017 IntelliFlo pump addresses both of these issues head-on. Although it is fairly pricey, its high quality, efficiency-minded design and construction allow it to use as much as 90% less energy compared to competing units. All in all, this Pentair Intelliflow variable speed pump is a great choice for buyers who are looking to cut down on their usage of electricity and are interested in the SVRS shut-off feature. The pump’s relatively high price may turn some buyers off initially, but its energy efficiency, rugged construction, and sophisticated diagnostics should be taken into account, as well. This particular Pentair pump is therefore suited to those who are willing to make a relatively significant up-front investment in exchange for what must be regarded as one of the most advanced pumps on the market. It will make for an especially attractive choice for applications where the still-uncommon SVRS safety feature will shine alongside the pump’s other strong points. The pump’s built-in safety vacuum release system, or SVRS, allows it to detect when the drain of a pool or spa is blocked, with the pump automatically shutting off so as to avoid a whole class of potentially tragic accidents. Targeted at those who demand the best and safest pool equipment on the market, the pentair intelliflo vf 3 hp pump can be used for everything from spas to full-sized pools and boasts a number of other advanced features, too. Fully Programmable Pump Speeds – Controlled by a powerful electronic brain, the Pentair IntelliFlo can be programmed to operate at any of four desired speeds for a wide range of potential applications. The pump’s output can be set to precisely supply particular filters, circulate given volumes of water in spas, or to power water features. Being able to program the pump in this way can cut operational costs by as much as 90% compared to running a “dumb” pump full-time. 100% Compliant with the Virginia Graeme Baker Safety Act – Named after a young girl who suffered a tragic drowning after being unable to escape the suction produced by a spa pump, the federal Virginia Graeme Baker Safety Act laid down mandates for public pools and voluntary guidelines for private ones. The SVRS model of the Pentair IntelliFlo is the first consumer-grade pump to be fully compliant with these recommendations, automatically shutting down when hazardous situations of this kind arise. Sophisticated, Reliability-Enhancing Diagnostics – The Pentair IntelliFlo is advanced in other ways, as well. 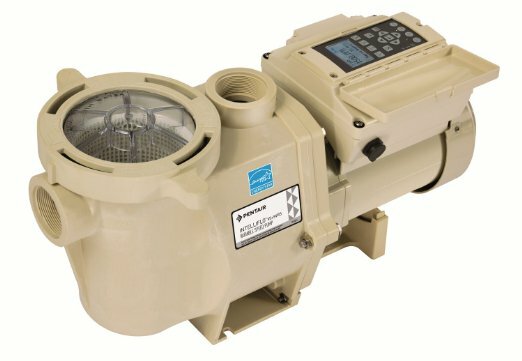 Where common pool pumps regularly fall prey to problems like overheating, voltage fluctuations, and low operating temperatures, the IntelliFlo is equipped with diagnostic circuits that allow it to detect these problems and respond appropriately. That makes the IntelliFlo far less likely to fail under any conditions, from everyday usage to extreme, unexpected weather. All the Important Certifications – The pump’s ENERGY STAR® certification shows that it lives up to the high efficiency standards of the Environmental Protection Agency, with the NSF certifying that the pump meets the relevant safety standards. The IntelliFlo SVRS is also certified under ASME A112.19.17.2002, with that safety system exceeding the most demanding associated requirements. Top-Quality, No-Compromise Construction – This Pentair IntelliFlo 3hp variable speed pump uses high quality materials and the most exacting design and manufacturing processes throughout. High-precision construction and a 3 horsepower permanent-magnet motor make it one of the quietest pumps on the market, while also contributing to long-term reliability and its impressive energy efficiency. The majority of the pentair intelliflo high performance pool pump reviews online are highly positive, although a few common concerns stand out. For starters, while many reviewers at Amazon and elsewhere appreciate that this is one of the few consumer pumps available with an SVRS automatic safety cut-off, some have experienced problems with it. Although the SVRS can be an important feature, it is not capable of distinguishing between drain blockage caused by the presence of human beings and pressure changes of other kinds. This means that the SVRS can be triggered by automatic pool cleaning systems or even solar heaters, and there is no way to entirely disable this functionality. Many reviewers have noted that this advanced pump carries a correspondingly high-end price. The pump’s energy-saving features should make up for this over time with reduced electricity bills, but this does mean that a relatively large initial investment will be needed to take advantage of what it has to offer. Finally, some buyers have expressed frustration at the pump’s programming interface. Compared to pumps that lack this functionality, installing and configuring the IntelliFlo will require more up-front work, as well as becoming comfortable with the controls. The payoff for that is that the IntelliFlo delivers more flexibility than simpler alternatives. This entry was posted in Pool Heaters & Pumps on November 23, 2015 by Luke.